Guide to Freedom reveals much of the recently rediscovered Underground Railroad of Frederick County, Maryland. A border county in a border state during the Civil War and situated amidst a major funnel of Underground Railroad routes just to the east of the Appalachians, Frederick County was a major conduit for freedom seekers between the slave state of Virginia and the free state of Pennsylvania, both adjoining the county. Despite Frederick County's geographic importance to the Underground Railroad, most of its fascinating Underground Railroad history had nearly been lost to time. With the aid of local historians and others who came forth with documentation and their remembered oral traditions, Peter Michael's Guide to Freedom presents one of the very few detailed pictures of the Underground Railroad in any border or southern state. Guide to Freedom details all confirmed or suspected Underground Railroad safe-houses and routes in this one United States county and rates each according to the strength of its oral tradition or documentation. What emerges is a network of six confirmed routes, more than fifty confirmed or suspected safe-houses, and nearly twenty identified Underground Railroad freedom seekers, safe-house operators and conductors. Of high interest to readers are the stories of individual freedom seekers who passed through Frederick County including several who were sheltered in the stone spring house at the author's Cooling Springs Farm. 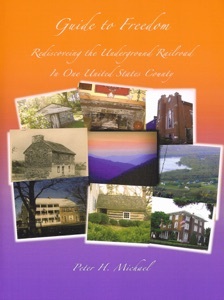 Moving beyond Frederick County, Guide to Freedom details seven nearby Underground Railroad sites of prime national importance, provides directions for several road tours, and offers guidance for further Underground Railroad reading and exploration. Aside from being fascinating reading, Guide to Freedom shows the way for others wanting to reveal the Underground Railroad histories of their own locales.